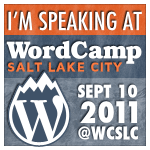 I have a few posts I need to write, but wanted to quickly mention I’ll be speaking at WordCamp SLC this saturday on Demystifying CSS & WordPress. They have a bunch of other great sessions lined up. Looks like there are only 8 tickets left, so if you want to go, hurry up and register! Looking forward to your talk! !